Country Contours presents: Andy Mac's tribute to Country Music legend Merle Haggard. Andy returns to 'the Back Room' at Lotus Realm Music Shop, with another evening of entertainment, music and banter. 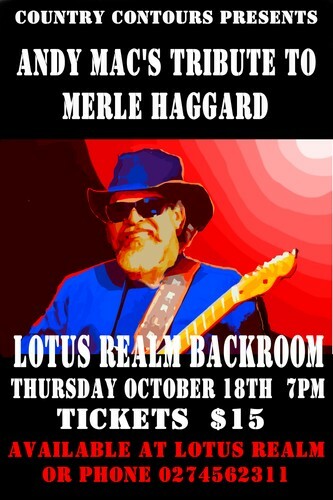 He will also be raffling off an original artwork mixed media painting of Merle Haggard (value $250), Raffle tickets $2 each or 3 for $5 from Lotus Realm. Concert tickets $15 ea available from Lotus Realm 714 Pollen St Thames. To pre-book phone or call in to Lotus Realm 07 868 5341 or 027 456 2311. Be quick, places limited. Door sales available only if not already sold out.